Here in the Pacific Northwest, one thing is vital to our way of life. Coffee? NO! Windshield wipers! After all, it does rain here 24 hours a day, 365 days a year!! Just kidding. So one day when driving our classic street rod through yet another drenching downpour with the feeble vacuum wiper not even coming close to keeping the windshield clear, it hit us. What was needed was a modern electric wiper to replace the old vacuum units. And thus was born The Mighty Wiper. A compact, reliable electric wiper for street rods. Constructed of the highest quality materials here in the USA, it is THE solution to clear driving vision. 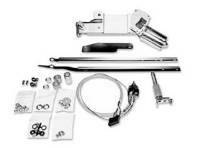 We also manufacture the RainGear line of complete dual wiper systems for classic Chevy and Ford cars and trucks. The RainGear line replaces the not-so-wonderful cable and spool wiper system found in the 1953-1957 Chevy cars and 1953 to 1962 Corvettes with a modern electric system. 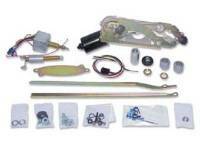 The line includes systems for 1947-1959 Chevy/GMC trucks, 1948-56 Ford trucks and our latest systems for early Camaro/Firebird/Novas.